I would like to announce the launch of my book trailer. You can find it on youtube, vimeo, and my Facebook page. Here is a link to my Goodreads page where I discuss the logic behind the clip you will see. Also, soon I will have a new website dedicated to my fiction career. I will let you know when it is live so you can join me there! So far, all the reviews have been great. Here's another 5 star review! 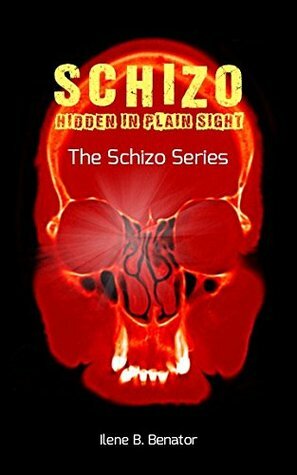 A schizophrenic patient, Catherine, has visions of patients in terrible danger in Chicago hospitals, visions that could be dismissed out of hand as delusions, except that every detail checks out...Ilene B. Benator’s Schizo: Hidden in Plain Sight is absorbingly riveting, a tale that is as seductive as it is terrifying. My first completely independent review from Readers' Favorite is a 5 star review! See link for the non spoiler excerpt (the first paragraph has too many spoilers for me to publish in its entirety). Please pre-order on amazon via link. Some years ago, I got a chance to listen to Michael Palmer speak. He had a lot of great advice. Someone asked him what he least enjoyed about being an author. One of his answers echoed what I heard from other famous authors: going to print. Please read the rest of this article I blogged on Goodreads. Why bother getting a publisher? Hi there, I am linking and posting a partial of my blog that I am doing for my new book Schizo. It is on Goodreads. I am an Emergency Physician. And I write. I have always been writing. I recall in 2nd grade and for a few years, instead of buying a card for my grandmother, I wrote my own--creating my own poems for the inside. I wish she saved them! Also, please pre-order my book on Amazon. If you want to see a detailed review by Dr. Andrew M.D., J.D. of my book, "How to Survive a Medical Malpractice Lawsuit" see link. She writes, "…is one of the best books I have read on the subject…physicians should actually read it before the spectre of malpractice raises its ugly head. And then, if and when litigation strikes, read it again." @KevinMD has posted an excerpt of my book on his blog. It is about how to prepare for the deposition. Amazon.com has a few pages from the beginning of my book. I've seen a lot said and written about the fact that good documentation will prevent a lawsuit. I disagree. Good documentation can go a long way to getting a defendant's verdict at trial. It might even be able to help you get your case dismissed. But good documentation rarely prevents someone from being sued. Nevertheless, good documentation IS the cornerstone of a strong defense. But what is considered good documentation? There is a myth perpetuated amongst many physicians that the "less is more" tactic applies to their documentation. By this logic, the less you write, the less that can be twisted around and used against you. However, juries perceive this differently. In an example of a missed brain bleed like a subarachnoid hemorrhage, it is better to mention something about it in your documentation. From the jury's point of view, it is better to consider something, use your judgment, and be wrong, than not to consider something at all. Judgment calls usually lean towards the defense. Careless doctors who don't even consider a brain bleed end up with plaintiff's verdicts. So abandon the "less is more" guidance for chart documentation. Instead, realize that the more you write the better it is for your case. Regarding documentation, it should go without saying, but I will say it anyway due to its extreme importance: Never alter your chart. Anytime you retroactively buff your chart, it will come back to haunt you. Whatever you think might be damaging that you feel the need to change, is actually very defensible compared to an altered chart. Good attorneys can make bad charts appear good. Nobody can repair the damage to a case once it is revealed that you altered the chart. Sometimes there are mistakes that were made in the documentation that you noticed long before any claim was made against you. You are permitted to correct mistakes by two methods: 1) Draw one line through it, write the word "error," then time and date the alteration. 2) Add a separate addendum. Once a claim is made, however, no addendums should be added. There is another circumstance that deserves mention. For instance, it is possible, even likely, that your carefully prepared chart can be lost by the billers and/or medical records department. Most facilities will inform you of charts that have not yet been completed. And it is usually part of your responsibilities to your employer and/or the hospital to have fully completed charting. If you have a situation where you are being told to prepare a chart for a patient you no longer remember, months after rendering your care, do so only if you feel you can honestly recreate a chart based on available materials at your disposal. In this special situation, you would be better off having minimal documentation that would lead to under-billing the patient, than to have a chart that could be misconstrued as falsified. In fact, for legal purposes, it might be better to avoid any delayed charting whatsoever, and leave the documentation incomplete. This is especially true if this patient had a bad outcome and could possibly lead to a lawsuit. Amazon site has been created with pre-order capability. Please pre-order and help my rank get started before launch. In the same vein as Robin Cook and Michael Palmer, Dr. Ilene B. Benator crafts a terrifying medical thriller that is sure to excite. An ambitious future surgeon on his psychiatry rotation is assigned a patient who reveals to him information about an organized plot to control the population. His pursuit of the truth leads him to become a psychiatric patient in the same facility. Dan Greenberg was a promising medical student who was derailed by Catherine--a bizarre schizophrenic patient whose delusions about patients in danger at hospitals all around Chicago were startlingly specific. Drawn by both curiosity and compassion, Dan investigates, discovering that they were exactly where Catherine said they would be. Who are these people? Why are they in danger? Are they connected with each other? While incarcerated, he joins forces with an unlikely ally Jake--who murdered his family during a drug-induced psychotic break, but is also a charming hacker with street smarts who creates a plan to get Dan's life back. In his attempts to do so, he threatens to uncover a conspiracy to track and manipulate the population by a cabal of influential people who will do anything to keep their plot secret. He will learn just how far powerful people will go to stay in control, and the high price of the truth. Schizo takes readers on a wildly unexpected journey into the what-ifs of medical science. Written by an Emergency Physician, Ilene B. Benator crafts situations that are terrifying, yet all too believable. I have been holding back until all the "i's" were dotted and "t's" were crossed. And then for a cool book cover. But I cannot hold back any longer. My first fiction novel is being published! Here is a quick teaser: An ambitious future surgeon on his psychiatry rotation is assigned a patient who reveals to him information about an organized plot to control the population. His pursuit of the truth leads him to become a psychiatric patient in the same facility.